I’m still floating on cloud 9 after this past week. We got to see our little man, count all his little fingers and toes, and make sure he was doing alright. I have never been so nervous for an ultrasound. With everything that happened early on in this pregnancy and dealing with the unknown of how bad our ABO incompatibility will be, I just didn’t know what we were going to find when we actually “saw” him. I’ve managed to stay pretty optimistic and not let this incompatibility completely ruin this pregnancy and being able to leave the hospital with a good report was just what I needed. And finally, the best part of the whole week … we finally get to call him by his name! And let me tell you, it was no easy feat coming up with this name. It had three different spellings before its debut. Boy names are so hard! 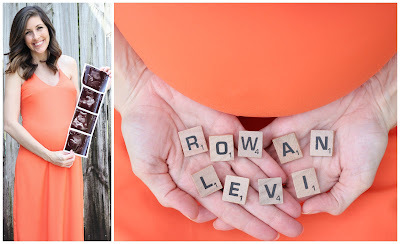 My husband and I both liked “Rowan,” but with it being a unisex name we really wanted to make sure we took the girly factor out of it. It was to be spelled “Rohen” for a few weeks until I got cold feet and feared everyone would over pronounce the “H” making it sound like Ro-HEN. So then, we compromised at “Rowen.” I got the “W” and my husband got the “E,” but after googling what would be the better choice we figured out Rowen is a derivative of Rowena which made us feel like it was the more feminine choice. About that same time, we received a children’s magazine in the mail that had lots of embroidered gifts and PJ sets and all the boy ones had the name “Rowan” on it. So we went back to google to determine if the “A” was really what we were comfortable with and found that it was the more masculine spelling for us. While the first name endured spelling drama, we’ve been set on his middle name since before we even knew we’d have a HE. Levi is a family name on my husband’s side. It belongs to his Grandfather who passed away when he was younger and it also happens to belong to his Uncle who is the Pastor who married us. So, Levi holds a lot of weight for us, and it only seemed fitting to incorporate it if we ever had a boy. Mykenzi is a 4th generation “Elaine” on my side, so now Rowan gets to carry on a family name on my husband’s side. I hope this makes them both proud that their names hold so much meaning. Total weight gain? 13lbs. I’m averaging about a pound a week these days. Maternity clothes? I’m like half and half. I broke down and bought a pair of jeans the next size up (not maternity) so I could actually wear something other than leggings while this weather decides if it wants to warm up or cool down. Plus, I figured they would be good for the postpartum days. Sleep? Is terrible. I just can’t get comfortable and all the pillows in the world can’t help me. My hips, knees, and lower back ache so bad … I eventually fall asleep out of sheer exhaustion. PEAK of the week? Seeing baby boy! I’m so anxious to meet him. PIT of the week? The stress leading up to the ultrasound. My already overly anxious nature is magnified during pregnancy so of course all the bad thoughts would flood my mind. Big Sister? She did so well during the ultrasound. She would point at the TV and say, “Baby!” and we even got her to say, “Brudder.” which was when my heart melted into a puddle on the floor. I absolutely can not wait for her to be a big sister. Daddy? I’m so thankful for him, he is always more than willing to rub my back or feet to help me feel better. I’ve said it before and I’ll say it again, I couldn’t do this without him! Miss anything? I’d love a good cocktail! Movement? I’ve been saying for weeks how he’s not as violent as Mykenzi was in the kicking department, but watching him on the ultrasound made me realize just how much he does move! It was great to see his movements compared to what I’ve been feeling so now I can better identify what he’s doing. Although, he has been more gentle than Mykenzi was occasionally he gives me a good wake up call that catches me off guard. He is breech at the moment so his feet are low, so one good kick feels like his foot is going to come out my bottom. Weirdest feeling ever. Food cravings? Chocolate Chip Cookie Dough Ice Cream still and we went to Waffle House after our appointment and I was going to order a Blueberry Waffle for old time’s sake but they were out of Blueberries so I ended up with an Apple Crumble Waffle and it was heaven. Mykenzi was made of Blueberry Waffles and Rowan just might find himself made of Apple Crumble Waffles. So freaking good. Anything making you feel sick or queasy? Bras. If I wouldn’t flop all over the place in public, I would just probably not wear one EVER this pregnancy. Symptoms? Still battling dry skin and dry hair, but Coconut Oil treatments on both seem to be doing the job. Good thing he’s worth it! Belly button in or out? Flat, but if I’m really full it pokes out a little bit, so I’m wondering if it’ll pop this time. Happy or moody? It was a very happy week. Looking forward to? My birthday next week! Excited to spend the day with my favorites. My 30’s have been my favorite yet, so I’m really looking forward to what 32 has to offer. You look gorgeous mama! I love his name! Such sentimental and important meaning. That's how we chose Sophie's name too 🙂 family names. I loved wearing bras in my pregnancy I felt like they prevented everything from spilling over and I felt somewhat more secure with one. I can't believe it's making you sick 🙁 That's something that's supportive, well should be ha.